Omnify Software is a leading provider of Product Lifecycle Management (PLM) products. Omnify Empower includes key features such as: Item Master/Part Data Management, Bill of Material (BOM) Management, Change/ECO Management, Quality/CAPA Management (QMS), Project Management, etc. The Omnify Empower Suite of products includes modules and features to integrate the Omnify Empower PLM products with Altium to help Designer users to easily find critical product data, eliminate mundane paperwork tasks, increase productivity, and remain focused on designing new products. The system will also streamline the process of loading released design data from Altium to Empower. 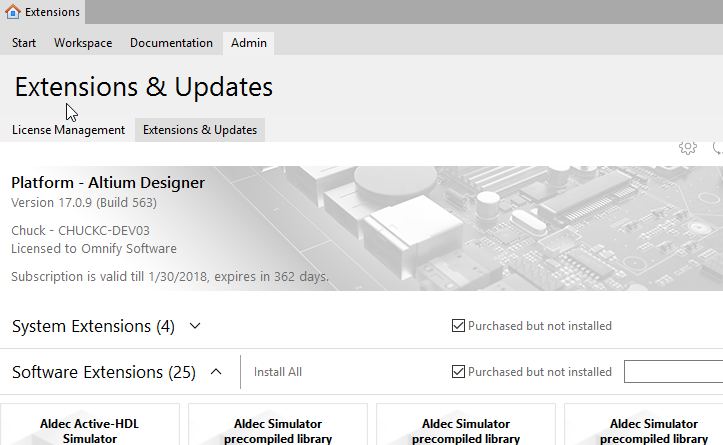 Integrate the Altium Designer libraries with the content from the Omnify database to enhance design decision and ensure a "Correct by Construction" design process. The system provides Designer users with access to common part data such as: Attributes/Parameters, Documents/Datasheets and Vendor Information as well as extended data such as: costs, lead times, status, "Where Used", availability, change history, signoff workflows, Change/ECO information, Quality issues, etc. Automatically create and upload BOMs from schematics to Omnify without using the Designer BOM tools or generating external files. The system allows you to create prototype BOMs, custom reports, and prepare BOMs (verify parts, automatically create variances, and identify components to ignore). Check and update design components with the Omnify database to verify revisions are synchronized and all component data is consistent. Request new parts and automatically assign parameters based on schematic components. Omnify Software provides a single, secure environment to manage component data, Bill of Materials (BOMs), engineering changes, product documentation, and to track/process changes and issues. Integrating Altium Designer with Omnify Empower enables collaborative design directly from the engineering desktop. 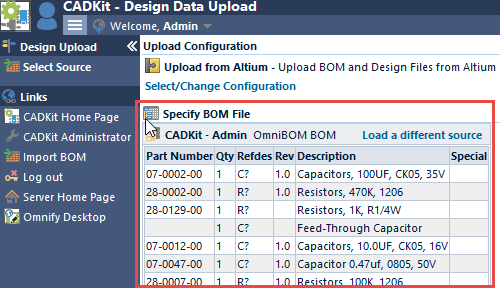 Omnify provides an Altium Designer Extension that allows users to add and update schematic components from the Omnify database, as well as create BOMs to be uploaded to the database. 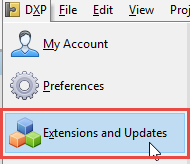 You can install the CADKit Extension by selecting the Extensions and Updates command from the DXP menu. 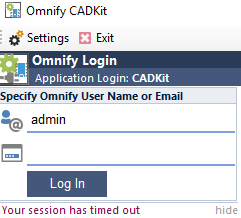 From the Extensions form you will be able to install the Omnify CADKit Extension. Once the CADKit Extension has been installed, the Designer menus and toolbars will be updated with links to Omnify CADKit. These options will be available when a schematic is the active document in Designer. Selecting any of the commands will launch the CADKit Altium Adapter. When you launch CADKit for the first time, you will be presented with the Settings page. You must set the Main Server URL option before CADKit will direct you to a specific form. 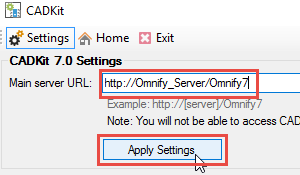 Set the Main Server URL option to the Omnify Server installation URL. Contact your Omnify Administrator if you do not know the URL. The URL should be something similar to: http://[Omnify_Server_Name]/Omnify7. Click the Apply Setting button, to be redirected to a CADKit form. When the adapter is invoked, CADKit will begin communicating with the Altium Designer application. You will also be asked to log in with your Omnify database credentials, if not already. Database Libraries allow you to link component information stored in a database to schematic symbols. When using database libraries, the user will be able to search for parameters and place components on designs with parameters populated with values from the database. 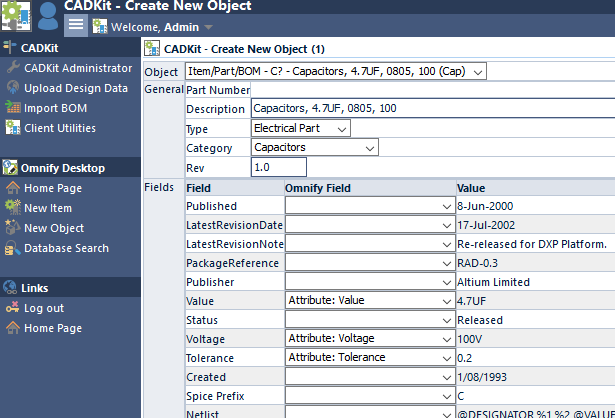 Once the Database Library is created, you can then search and browse the Omnify database directly from Altium Designer. You can add components and automatically populate the component parameters with content from the Omnify database. Key information, such as Part Numbers, Descriptions, Revisions, and Parameters/Attributes can be configured to be passed to the schematic. Once the Part Number has been placed on the schematic components, the system can verify and synchronize data between Designer and Omnify. Reports can be automatically generated from the design. You can verify that all parts on the schematic have a corresponding part in the Omnify database. This will allow you to identify new parts that must be requested. The Component Validator will read the attributes of the desired schematic components and compare them to the database to determine if each component has a unique match in the database. This will allow you to identify any changes made to the design components that have not been synchronized to the Omnify database. From the schematic, you can launch the new part request form to formally generate new parts for which a corporate part number has not been assigned. The system can automatically assign field values based on the component parameters. The system will automatically create and upload BOMs from schematics to Omnify.